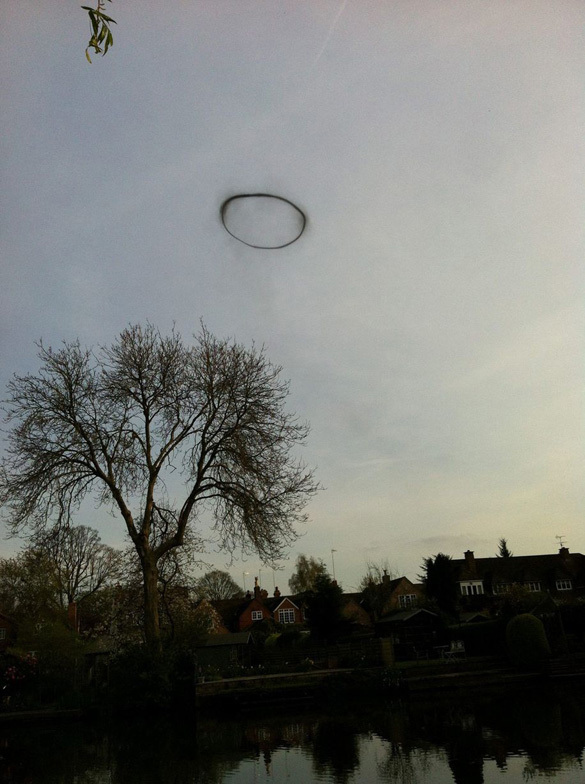 A mysterious picture of what looks like a black ring of smoke above the town of Lemington Spa in England taken on Friday has been making news this week. However, the BBC confirmed today that what has been dubbed the “Black Ring of Lemington Spa,” is actually a black ring of smoke. The phenomenon is known as a ring shaped vortex. A common example is a smoke ring like the one blown by Bilbo Baggins in the video below. 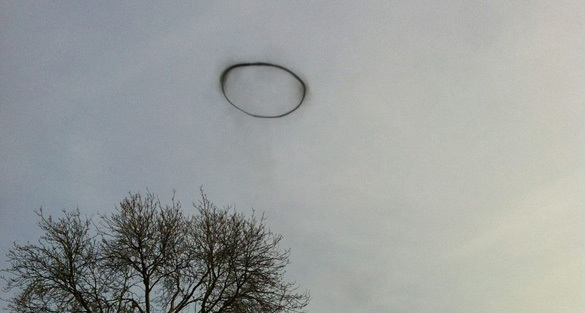 Doubtful News’ Sharon Hill tweeted us an article she posted with links explaining how a ring vortex is made. Boiled down, as far as I understand, they are created when smoke is forced out of a circular opening. In this video a fireball generator creates a large black ring that hangs in the air for quite some time. The ring in this video is similar to what witness say they saw in Lemington Spa. 16 year-old Georgina Heap took the picture with her iPhone. I looked up at it and thought ‘what the hell?’, it was amazing. It was just floating there like a cloud and then it disappeared. It wasn’t birds either. There were about ten of us who stopped what we were doing and watched. Although the Black Ring of Lemington Spa was suspected to be a smoke ring, local fire and rescue services had said there were no fires in the area. Local weather services also said the ring was not weather related. A thorough explanation of what causes the ring-shaped vortices phenomenon can be found at Caelestia.be, a website dedicated to researching unidentified aerial phenomena. I’ve seen it several times from various things. Usually someone is manually lighting off a boiler using diesel fuel. To get the torch lit they have to shut off the forced draft. Gas or fuel builds up in the passes and then the forced draft fan is turned on. The unburned fuel puffs and pumps out a smoke ring up a straight stack. It usually is caused by a backfire, not necessarily audible. I’ve seen an idling diesel locomotive puff a ring like this. So the fire department wouldn’t know anything about it. And usually the rings are more pronounced in the late afternoon sunset hours. Yes, In Argentina there was a case like this more or less 3 months ago. It was a smoke ring from a game park.